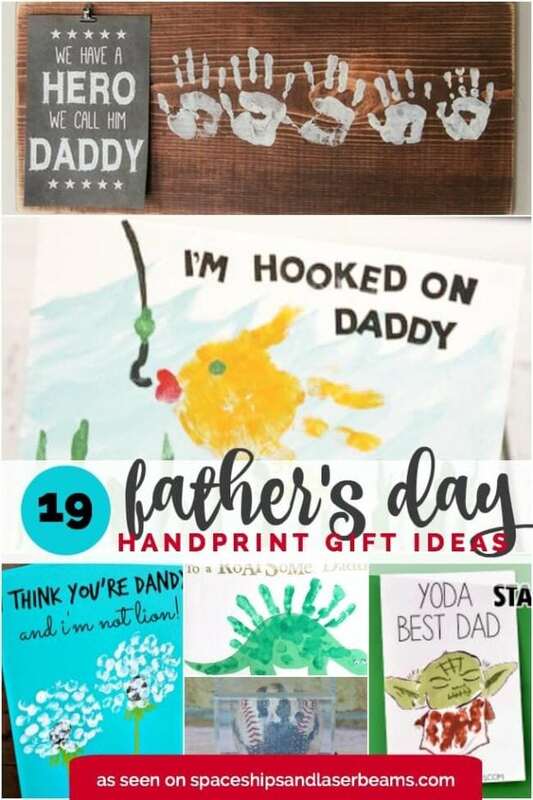 Take a peek at these 19 Father’s Day handprint gift ideas! Give Dad a hand [print] for all that he does! Not only do they make great presents, they are meaningful keepsakes for years to come. 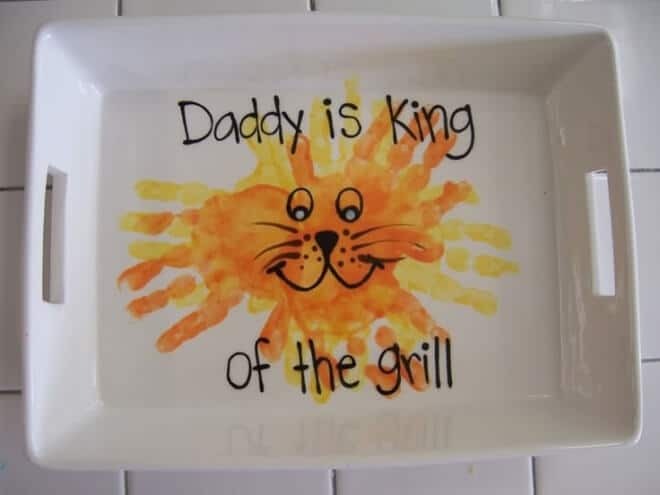 From a “king of the grill” tray to an “I’m hooked on Daddy” canvas to a “best Dad hands down” t-shirt, you’ll surely find a super gift idea. These 13 Free Father’s Day Printables will help complete your Father’s Day celebration. Not sure what to get dad this Father’s Day? Check out 15 Father’s Day Gift Ideas for Every Budget. 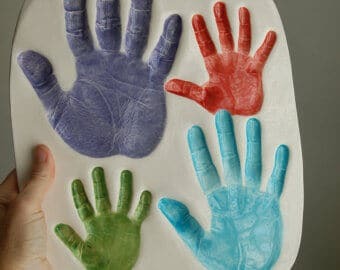 Plan to do some of these 20 Handprint and Footprint Crafts for Mother’s Day as well! Handmade gifts are such a great way to show a special father you love and appreciate him! Even heroes need to be reminded on occasion, how great we think they are. This custom wood sign proudly displays the free printable with this awesome sentiment: “We have a hero we call him daddy.” Cream colored acrylic paint is used to help each family member add their handprint to the sign. 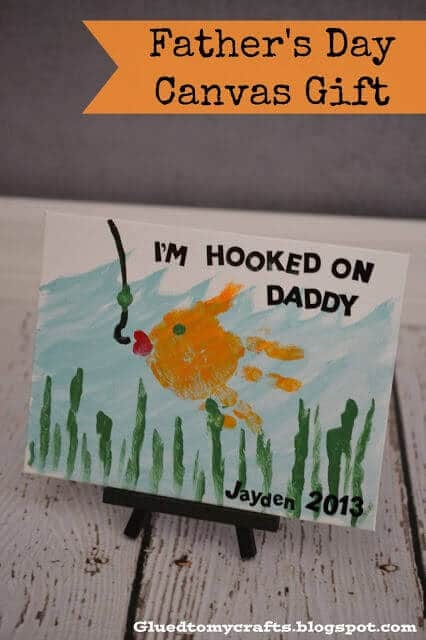 If you’re looking for a way to honor a special man in your life for Father’s Day, this “I’m Hooked on Daddy” canvas gift may be just what you need! 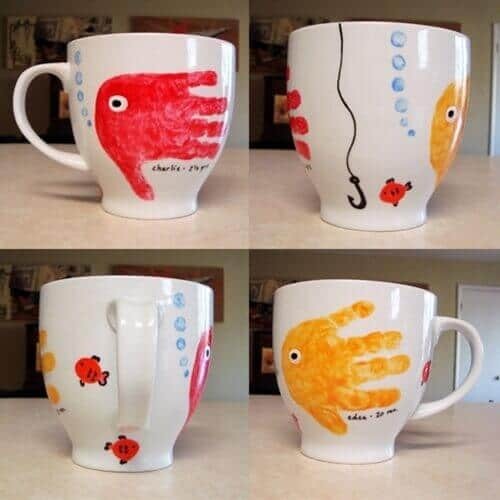 Especially well-suited for a man that loves fishing, your child’s handprint in paint becomes the fish! A 6” x 8” canvas, variety of paints and paint brushes, stickers and baby wipes are all you need. Don’t just tell your dad he’s king of the grill, show him! Deck out a grilling tray for dad this Father’s Day. Imitate the look of a lion by criss-crossing orange and yellow handprints to make a lion’s mane. Add facial features and text using a paint pen or marker. This farmhouse inspired DIY clip frame is an awesome gift to make for Father’s Day. 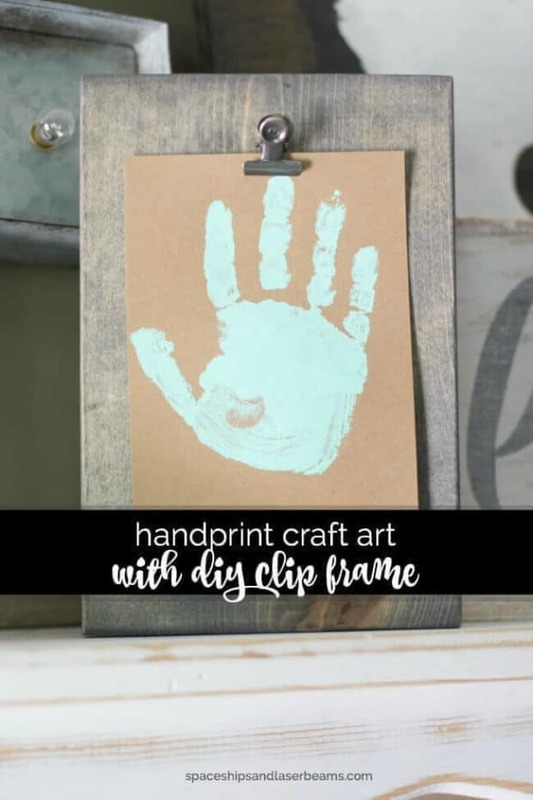 Clip a simple example of handprint artwork to the board for display. Is the dear old dad in your home a baseball fan? 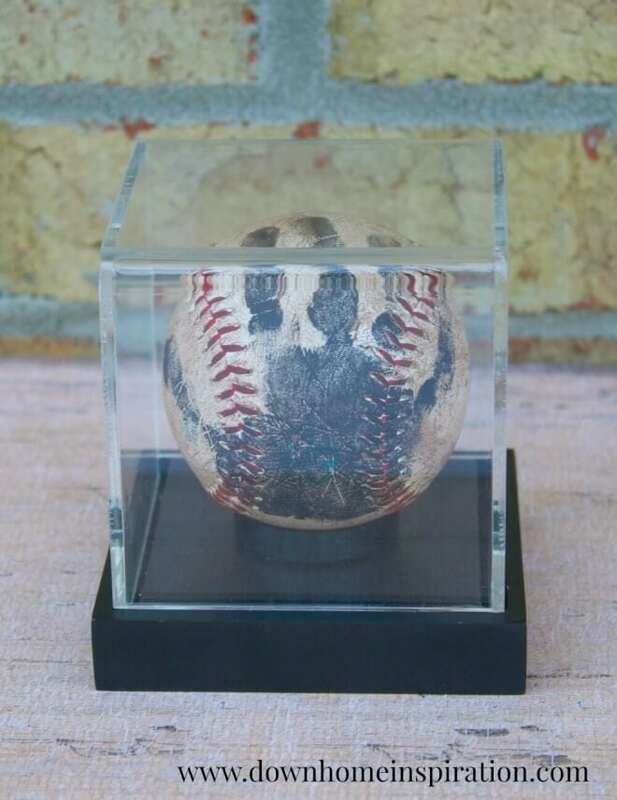 This easy-to-make aged baseball keepsake, features a child’s handprint! It is a winning gift idea for Father’s Day. Freeze your child’s handprint in time with this precious handprint Nemo card perfect for presenting to a father for Father’s Day. 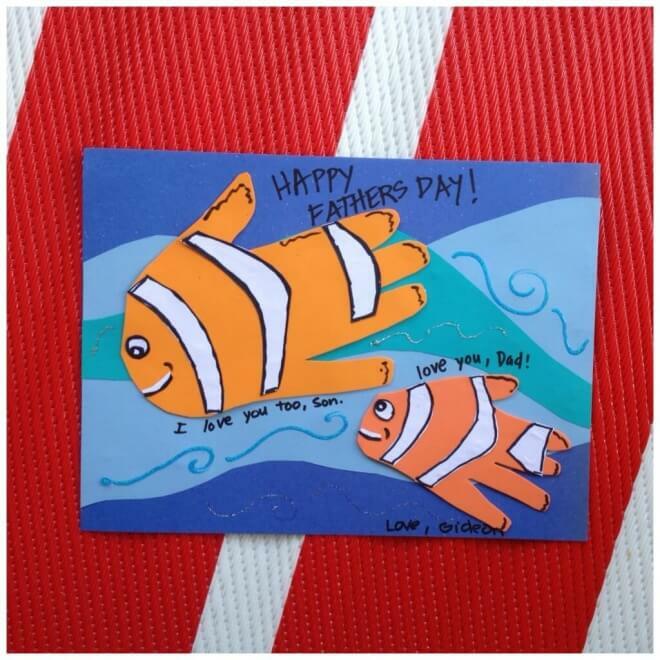 Trace both a father’s handprint and the son’s handprint on orange construction paper to create two Nemo inspired clownfish! Not only is this a creative gift, it’s also a memorable way to compare hand sizes year after year! 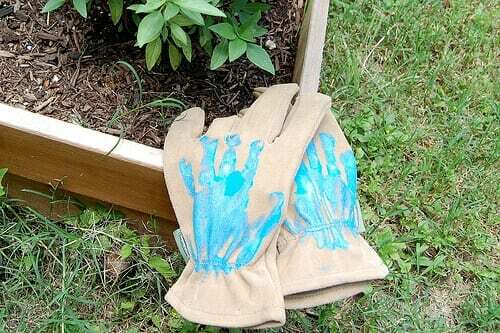 Celebrate a father who loves to garden with a new pair of gardening gloves! Add a set of your own helping hands, created from paint. 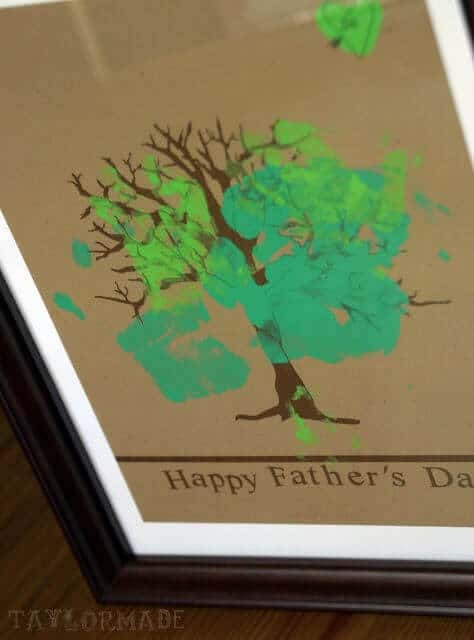 If you’ve got a Silhouette machine, whip it out for this Father’s Day tree art! You’ll need it to precision cut the tree and lettering for this project. Then a little paint and some adorable children & their hands are needed to give the leaves some greenery! If you are looking for an easy and inexpensive Father’s Day craft to make, this is it! It doesn’t get much cheaper than crafting up a project with materials you probably already have at home: flour, salt, water, paint and ribbon (optional). What makes this Father’s Day handprint gift idea especially fun is that it can get a little messy! Keep in mind, it does require you to bake the finished project on 200 degrees for 2 hours to help it set. This Father’s Day, give dear Dad a card that is out of this world! 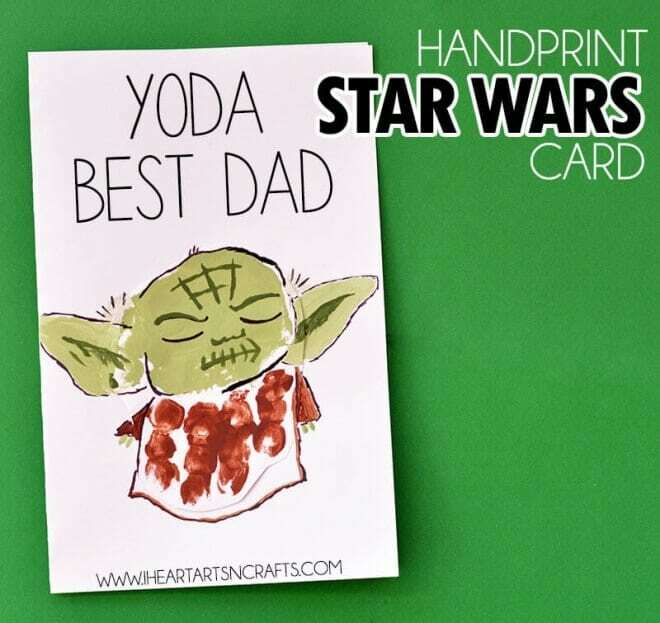 Using the palm of a hand and thumb, Yoda will make an appearance on this card. How else can you tell Dad “Yoda best dad”? Don’t forget dear old grandpa this Father’s Day! 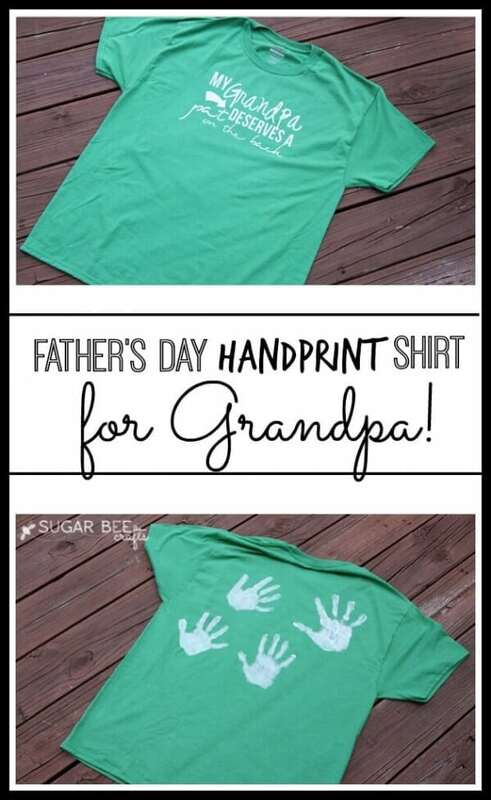 This handprint shirt reminds everyone that “Grandpa deserves a pat on the back.” Of course it should include “pats on the back” from all of the grandkids, made with paint! 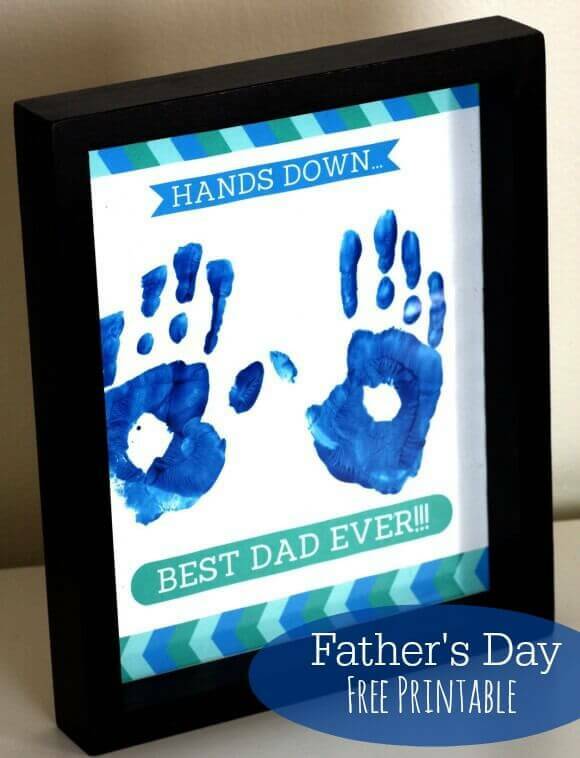 If you know a man who is “hands down the best dad ever”, this Father’s Day handprint art project is for you! Simply download and print the free printable, and grab some blue tempera paint. Coat your child’s hands and let them get to stamping! 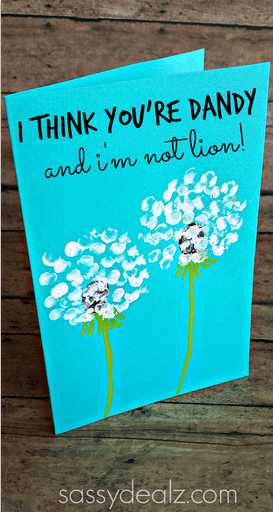 “I think you’re dandy, and I’m not lion.” It sounds like a great card sentiment, doesn’t it? Your kids will love getting their hands messy in finger paint to create the dandelions that go on such an adorable card for dad. A father is definitely a superhero in the eyes of his child(ren). 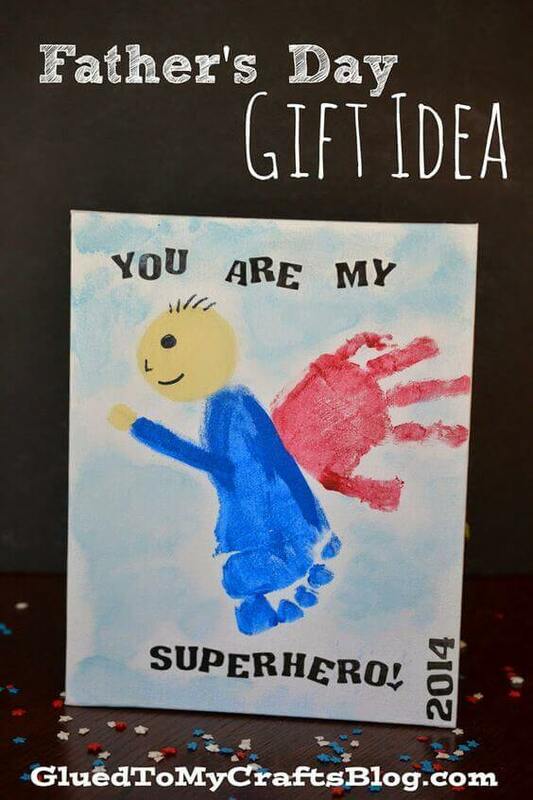 This superhero father’s day craft is a fun way to recognize that super father! Can you believe that a footprint from your little one is used to create the body, while the handprint is used to create the cape? Talk about a super use of a canvas board and paints! What dad wouldn’t love to receive custom made artwork from his little monsters? 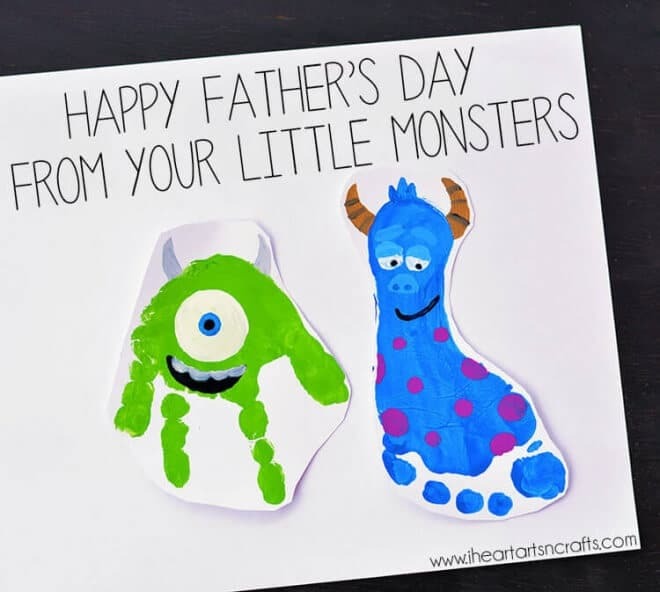 This Monster’s Inc. inspired Father’s Day art projects turns painted footprints and handprints into the famed characters Mike and Sully from Monster’s Inc.! Do you know a “roarsome” daddy? 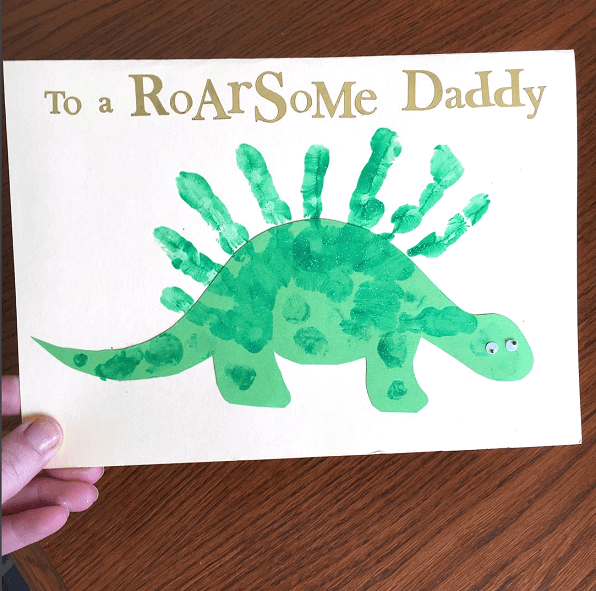 Honor him this Father’s Day with a handprint dinosaur card! This project is simple! Start by cutting out a dinosaur from green construction paper! Add green paint to your child’s hands to stamp spikes! Finish off with some googly eyes and a hand-written “You are RoarSome Daddy” note! Do your kids have the best dad in town? 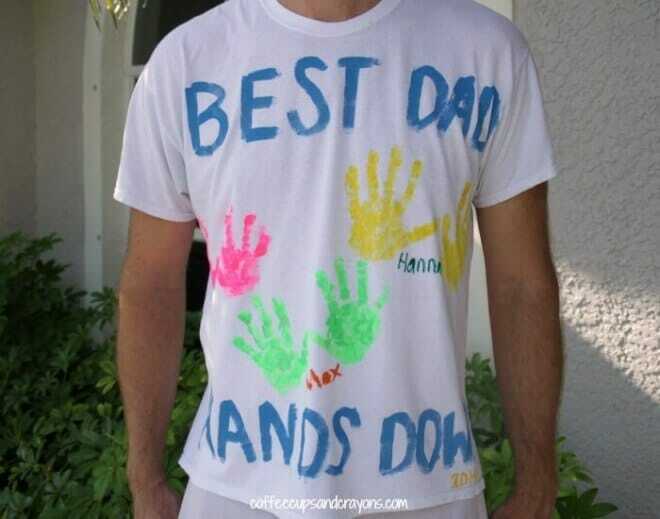 You know it, but now you can let everyone know it with these DIY “Best Dad Hand’s Down” t-shirts! This is a great family project and only requires a cotton t-shirt, fabric paint and markers, a paintbrush or sponge and a piece of wax paper (to help keep paint from seeping through the layers of the shirt). Help a special dad keep track of his car and house keys with this awesome handprint key hook! This makes a great gift for Father’s Day! You’ll need a wood round, acrylic paint, clear spray varnish, stencil letters, paint brushes and a wood knob. All of these materials can be purchased at your local craft store. 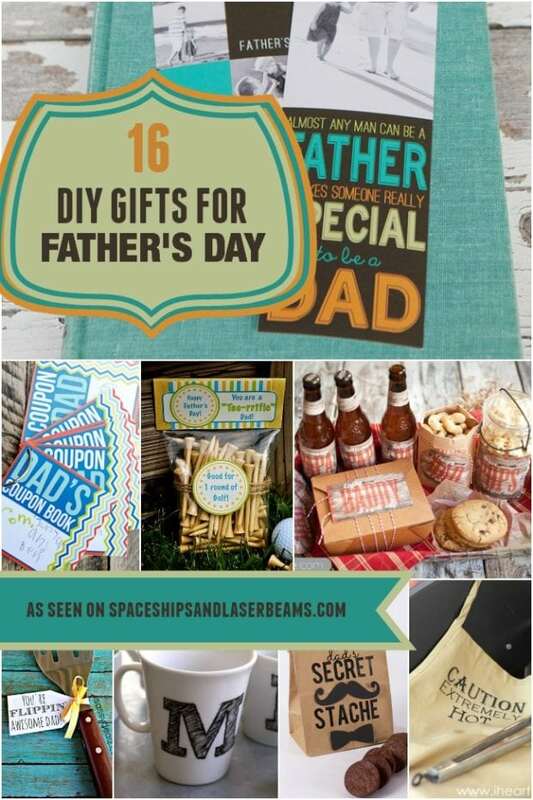 Kids will love creating a handmade masterpiece for dad with these great craft sources gathered by the crew at Spaceships and Laser Beams.